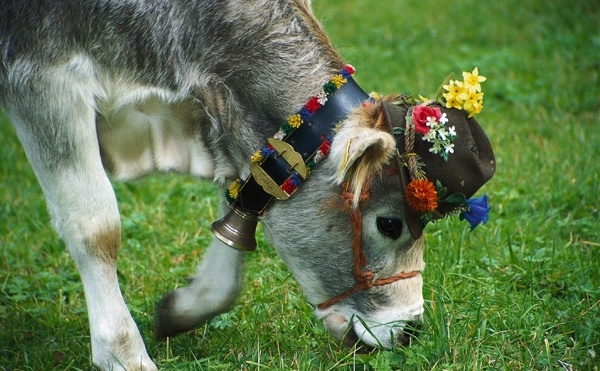 Calling all ski buffs and snowboard freaks….. there’s no need to mourn the passing of another skiing season as the last of the snow melts and the jagged icy alpine peaks are once more transformed into the lush flower-bedecked pastures of spring and summer, as late-season skiing and summer-skiing can be some the best of the year, with good snow, hot sunshine, low prices, no crowds and no lift queues. The Alps offer several summer glacier-skiing areas but, in our view, nowhere beats the Austrian resort of Hintertux, at the very heart of the Tyrol. And, what’s more, it’s open for skiing all year! This tiny, traditional working village is tucked at the foot of the mighty Tux Glacier, at the end of the picturesque Tux valley, hidden way beyond the popular winter resorts of Mayrhofen and Zell am Ziller. With 365 days of guaranteed snow, it is always peak season at Hintertux, whether you come for the spring snow, the summer sun or simply to get into shape during autumn for the season ahead. 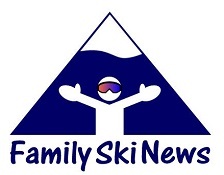 Thanks to its 100% snow guarantee and perfectly groomed powder pistes, it comes as little surprise to us here at FamilySkiNews.com that the Ski Resort Service International Team granted Austria’s only all-year ski resort the “Best Glacier Ski Region” award for three years running. Little wonder many top national ski teams train here, including the Austrians! Unlike other smaller glaciers, such as Kaprun or Saas Fee with their gentle, easy runs resembling Autobahns more than pistes, Hintertux offers an impressive 22 km of glacial slopes, ranging from long easy blue runs to demanding red and black runs, and even mogul fields for more advanced skiers. Summer snowboarder’s love the prepared half-pipes and even some moderately challenging off-piste possibilities. 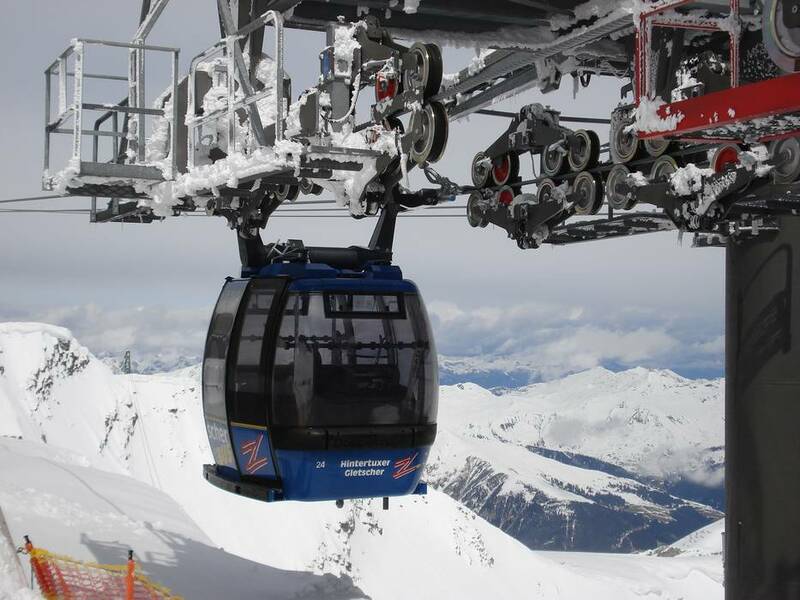 The glacier is approached by the giant state-of-the-art Gletscherbus 3 – the highest dual cable car in the world – which swiftly carries up to 2800 people per hour in 34 cabins up 560 metres to a high point of 2,660m in just under 5 minutes to the pistes. 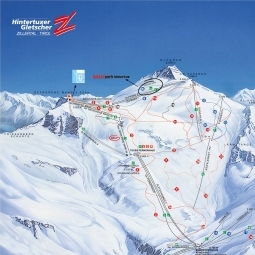 With sunshine and snow for everyone from beginners to champions, it is hardly surprising that Hintertux is Austria’s premier all-year-round ski area. If your family is just starting out skiing, a glorious sunny glacier with gentle slopes and warm summer weather could be the ideal time for you to learn. The local Tuxertal Ski School runs lessons year round, with ski and snowboard courses for all the family, from beginners to advanced. 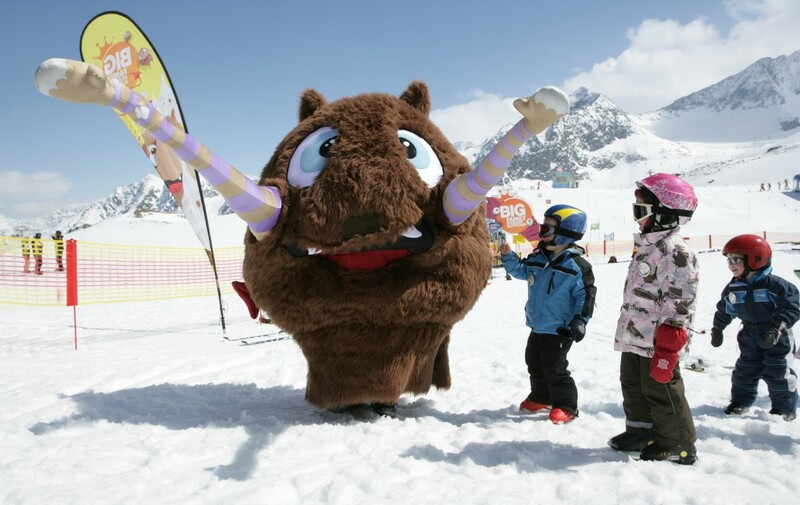 Kids’ ski programmes are based on 2 or 4 hours of skiing a day, with optional Kinderclub (Children’s Club) from 10am-3pm (including lunch). For children too young to ski or for those who don’t want to, they can spend the entire day playing at the Kindergarten. It is probably just as well that night life at Hintertux village is virtually non-existent in summer months, as you do need to get up early to get the best of the snow. The combination of the hot sun melting the surface of the snow during the day and clear cold nights refreezing it transforms it into magical spring snow consisting of light sugary granules which some people find even more exhilarating than powder snow. By lunchtime however, the snow can be heavy and slushy, providing the perfect excuse for a long, lazy lunch of delicious Austrian specialities at the Tuxer-Ferner-Haus at 2,660m or at the lively Gletscherhütte. 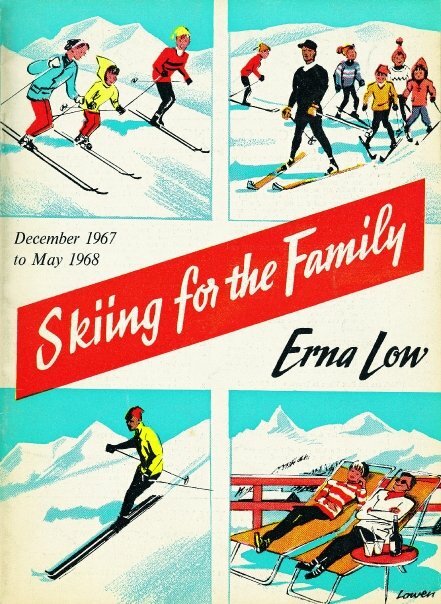 On the baking hot panoramic sun terrace, it is easy to think you are in the midst of a ski-model shoot as skiers strip down to their swimwear! On blue-ski days, you are also ensured breathtaking vistas of the Tuxer Alps and the Alpine Nature Park of the Zillertal Alps. Après-Ski …. straight after lunch! After lunch, it’s time to explore the icy-blue Spannagel caves inside the glacier (helmet, jacket and welly boots supplied!) and Nature’s Ice Palace, or to have fun at the Glacier-Flea-Park kids’ snow playground. 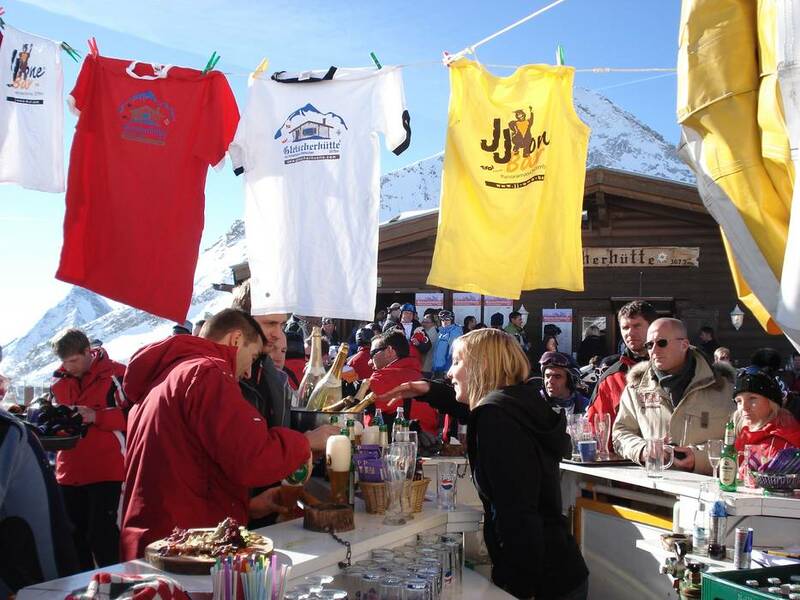 Alternatively, you can just hop on the high-speed cable-car back down to the village to indulge in one of a huge choice of après-ski activities, including over 250km of marked hiking trails, paragliding, ballooning, wild water rafting and canoeing, swimming in mountain lakes, challenging mountain bike ascents, thermal baths, squash, tennis, riding and archery. 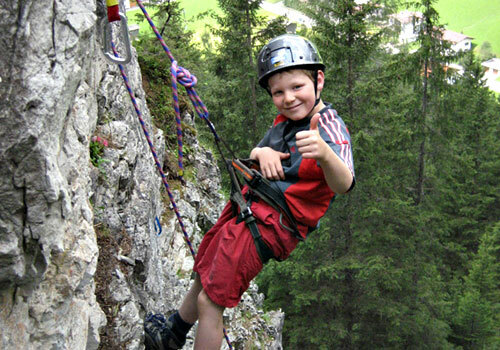 The tourist office also offers a daily kids’ programme of activities in Tux and Finkenberg, with such thrilling activities on offer as children’s canyoning and cave trekking, or fun and games at the Playarena – a vast play zone just for kids with a go-kart track, adventure climbing tower, climbing wall, trampoline park, high rope course, treasure hunts, campfire picnics, and soft-play areas. There are programmes for children 0-2, 2-10 and teens. Walking is one of the most popular pursuits in the valley, both on the glacier with its bizarre, glistening turquoise ice formations and breathtaking panoramas, and on the verdant lower wooded pastures with their abundant wild flowers, babbling brooks, waterfalls and flourishing wildlife. 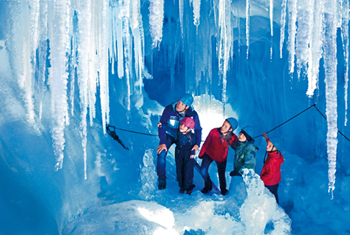 For those who have exhausted themselves on the piste, the themed trails are especially fun family pursuits, including the Tux River Adventure footpath and, our favourite, the Waterfall Trail. 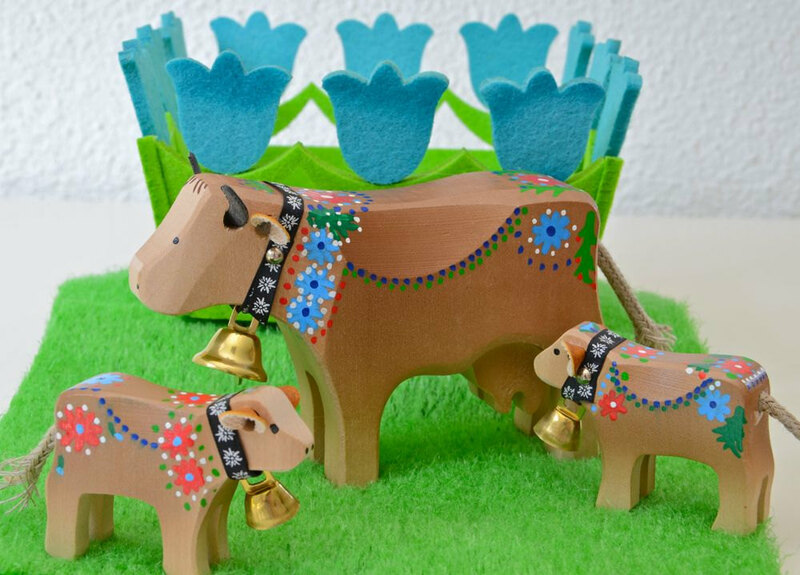 In the autumn, the annual Hintertuxer Oktoberfest (the last weekend in September) with its traditional Almabtrieb procession of florally-adorned cattle, farmers’ market, jovial music and dancing, is always a highpoint of the year. 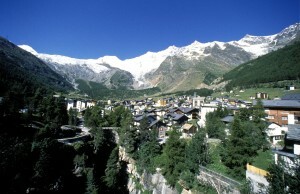 However you choose to spend your time – from adventurous off-piste skiing and paragliding to simply soaking up the sun in the valley and enjoying the famous Austrian hospitality – there’s no denying that few places in the Alps offer such a variety of summer pursuits in such spectacular countryside, crowned by the ever-present backdrop of the magnificent Tux glacier. Gone are the days of skiing 365 days of the year throughout the Alps on numerous glaciers sadly (with the exception of Hintertux!)…. However, there are still a handful of resorts offering plenty of summertime snow fun. ITALY: The Italian resort of Cervinia has 23kms of pistes and lifts operating from 7.15-13.30 when the snow becomes soft and slushy. 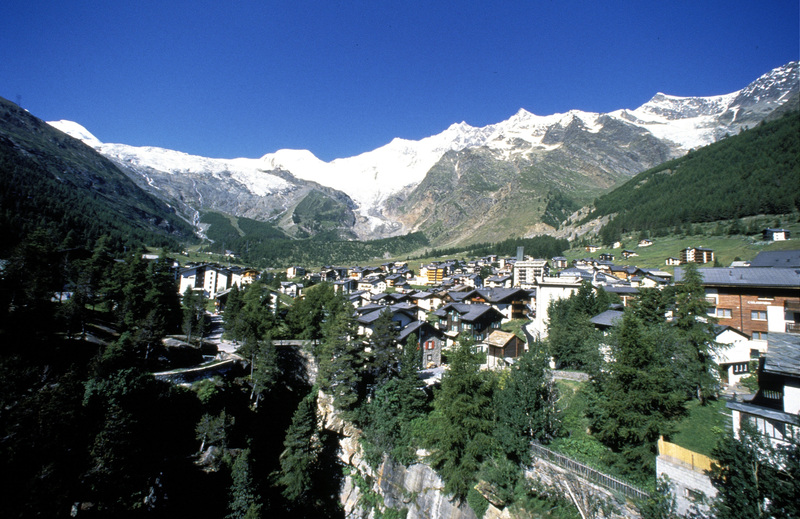 There’s also access to neighbouring Zermatt’s glacier ski area – one of the biggest, highest summer ski areas in Europe, but note – the last lift from Cervinia to Zermatt is at noon. In Val Senales, the glacier is open in early summer (lifts open from 7.30-13.00), with 3 lifts, 8kms of pistes, and a funpark. The area may open again in the autumn, depending on snow conditions. SWITZERLAND: Zermatt and Saas Fee are charming, traffic-free villages in neighbouring valleys, each with pistes open during summer months. In Zermatt, the lifts are open from 7am-2pm, with 8 ski lifts and 25kms of pistes over a vertical drop of 960m. There’s also a large fun park and a snowskate park. 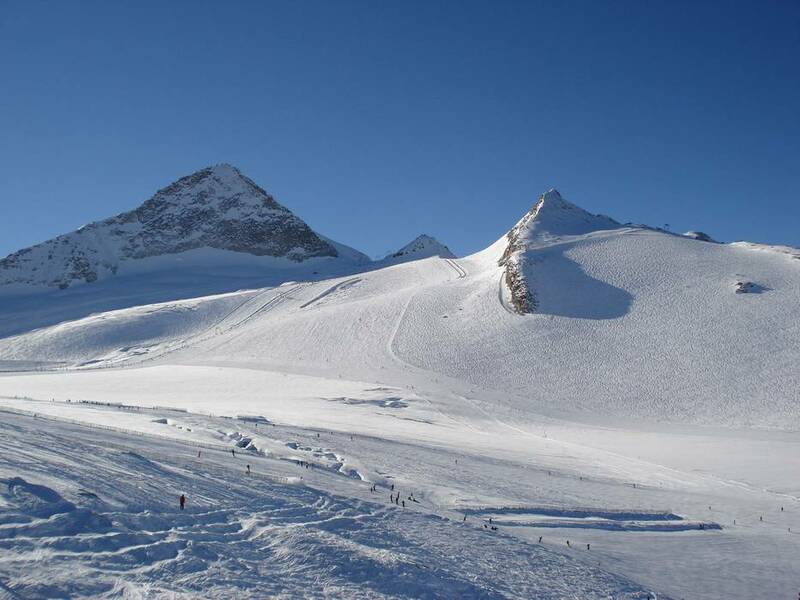 Summer skiing on the glacier at Saas-Fee usually starts in July, with around 20kms of pistes and lifts operating from 7am-1pm (until 2pm or 3pm in the autumn). AUSTRIA: The resort of Kaprun also boasts a reasonably extensive glacier-skiing area, with lifts from8.30-3pm. The Stubai glacier used to offer year-round skiing, but now it’s usually only open from late June until mid-September with just 4 lifts. The Dachstein glacier, near Ramsau and Schladming, is often overlooked during winter months but it is the most easterly glacier in the Alps and worth considering for a spot of summer skiing. It has an excellent well-prepared park for tricks (not for beginners!) and three decent runs too. 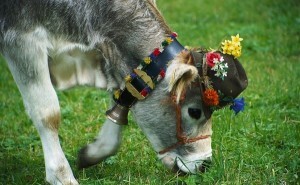 It is usually open from early summer-late autumn. 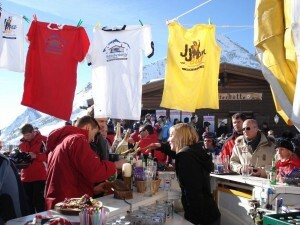 FRANCE: The most extensive glacier skiing in France is on the Tignes’ Grande Motte glacier ski area. It is open daily from 7.15-13.00 in summer with 16 lifts, over 20km of runs and a freestyle snowpark. Les Deux Alpes also has a decent summer ski area, with seven lifts open from 7.15-12.30, a handful of runs, a funpark and a freestyle park. For further information on the various skiable glaciers, see FamilySkiNews.com’s post on summer glacier skiing here. 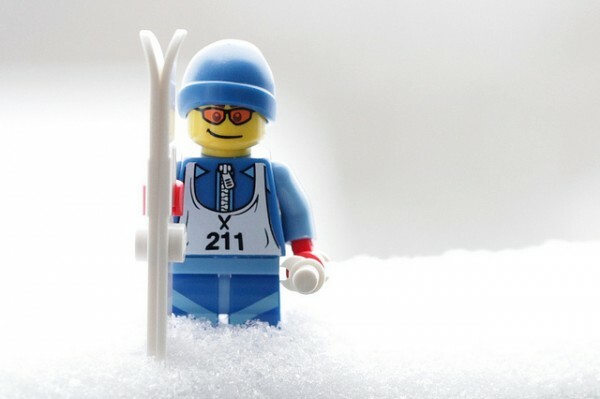 When skiing on the glacier, don’t forget to have high-quality sunglasses and extremely high factor sun cream – there are some special glacier creams available. Remember to reapply it frequently! Click here for more information on what to pack for summer holidays in the Alps.